The first of our three charity presentations took place this week. A cheque for £750 was presented to the pupils’ chosen local charity, Strathcarron Hospice. 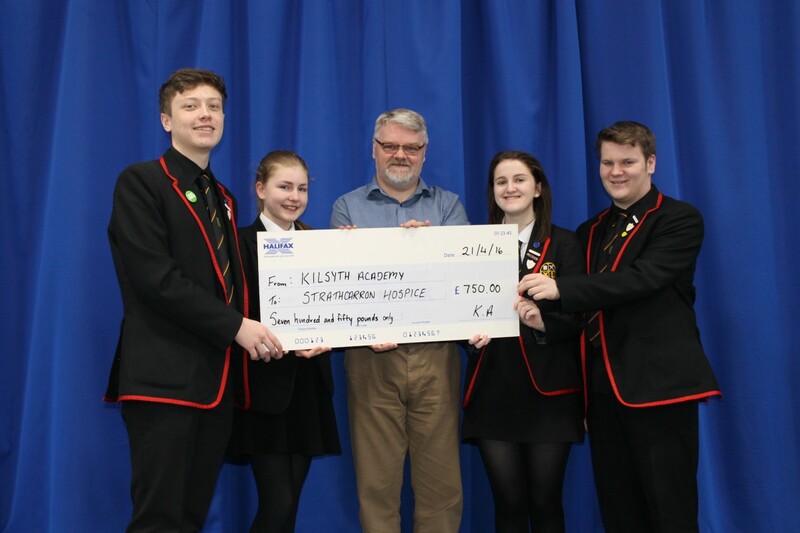 We were delighted to welcome Jim Brown from Strathcarron, to receive the cheque and Jim also shared a video of the hospice’s work, with pupils in S3 and S4. The campaign for the Kilsyth Academy Mock Election is now well underway and we look forward to hearing the outcome of the voting, early next week. There was a good turnout of pupils at the various Easter School tutorials, held between 4th and 7th April. We hope that this will have helped pupils with their preparation for the forthcoming examinations. Letters and personal timetables have been issued to pupils who will be sitting SQA examinations, during May and June. Study Leave, for S4, S5 and S6 pupils sitting SQA examinations, will be from 3rd May until 3rd June (both dates inclusive). Pupils who have no examinations will not have Study Leave and will be expected to attend school, during this time. The Parent Council will meet on Thursday 28th April, at 7.00 p.m., in the school. Congratulations to Matt Bendoris, the new Chair of our Parent Council. New members are always welcome. Well done to Erin Main and Kirstin MacLaren, for their organisation of the recent race night for Comfort Rwanda and Congo. The girls raised a staggering £1383, which will go to support the work carried out by the charity. Thanks too to everyone who supported the event, in any way. Preparations are now underway for the Kilsyth Academy mock election, to be held in the run-up to the Scottish Parliament elections. Hustings will take place on Thursday 21st April and voting will take place the following week over Tuesday and Wednesday 26th-27th April. The following pupils have volunteered to represent a party in the mock election: Amy Smith (S4), Amy Jarvie (S5), Connagh Connelly (S1), Iona Brownlie (S4), Blair Anderson (S6), Morgan Waite (S1) and Courtney Forsyth (S6). We wish them all a successful campaign! The annual Primary K’Nex Challenge took place last week, with each of our associated primary school entering teams of two P6 pupils. The model required was very challenging – a vehicle that included a steering mechanism – but all the children worked really hard and completed the project enthusiastically. The Winners were Balmalloch Primary and the runners-up were Chapelgreen Primary – congratulations to both teams. Many thanks to Mr Turnbull for organising the event. Congratulations to our musicians and singers who performed in the North Lanarkshire Music Groups Spring Concert, held at Glasgow Royal Concert Hall. This is the culmination of many months of rehearsals, held after school. Well done to Archie Grant, Erin Main, Kirstin MacLaren, Ben McDowall, Fiona Armstrong, Luke Shearer, Kieran McCann and Rebekah Machray. The school will re-open, after the spring break, on Monday 18th April. Study Leave, for S4, S5 and S6 pupils sitting SQA examinations, will be from 3rd May until 3rd June (both dates inclusive). Pupils who have no examinations will not have Study Leave and will be expected to attend school, during this time.